To fit your window boxes attach the supplied batten to the wall with the supplied screws and rawplugs and then slot the window box onto the batten. 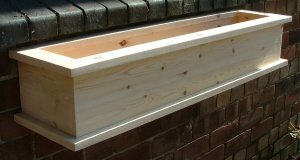 The Ercall window boxes have simple, clean lines, a perfect foil for your plants. 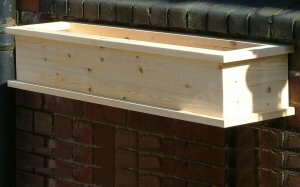 Ercall window boxes are made from Scandinavian red pine, fitted with our easy to use, concealed, hanger supplied with all fixings. If you would prefer a plain back to stand on a window ledge rather than hanging from the wall or fence, please make a note in the special instructions box when proceeding to checkout. The base has holes for good drainage and the window boxes can be finished in clear, golden brown or wild sage preservative. We also offer a selection of Farrow & Ball paint finishes. There are two basic kinds of compost : those containing soil and those that are soil free and are based on peat. If you are concerned about the environmental effects of cutting peat. choose a soil-free compost made with a peat substitute. These are usually based on coir, and may need extra fertilisers and more frequent watering. 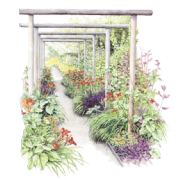 Proprietary 'planter' or' 'multipurpose' composts are generally soil-free with a slow-release feed, wetting agent and sometimes with water-retaining gel added. sand, and are largely-based on the 'John Innes' formula. They contain varying amounts of fertiliser, depending on what they are to be used for. John Innes No.1 contains very little fertiliser making it suitable for young plants, which do not grow well in high levels of plant food. John Innes No.2 has twice as much fertiliser as No.1. It can be used for fast growing young plants and for slow-growing plants which will be over-stimulated by too much fertiliser. For large or mature specimens use John Innes No. 3. This contains three times as much plant food as No. 1 and will sustain plants in the same window box for several years. If you want to grow thriving acid-loving plants, you will need an acid compost. These composts are lime free and are usually labelled 'ericaceous'. They also have plant food added. Some arrangements are so dense that the surface of the compost is hidden. However, if the compost is exposed, it is vulnerable to invasion by weeds and moisture will evaporate from it in hot weather; making frequent watering essential. The answer is to cover the compost with a layer of mulch which will help to reduce these problems.